You can experiment with savings goals and timing using our simplified calculator. Over time, the US stock market has returned 6-7%. Completely “risk-free” returns as of this writing are between 2.5-3% for 1-5 year CDs and bonds. These interest rates should give you some idea what to try for your savings goals. 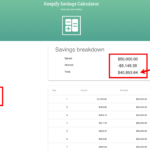 Check the table on the right to see your savings year by year according to what you input. Use the inputs on the left to pick your starting amount, expected interest rate, number of years to save, and contribution per year. After thinking about a savings goal, try out the retirement calculator below! You may want to adjust your retirement income upward for inflation depending on the number of years you’re looking down the road. 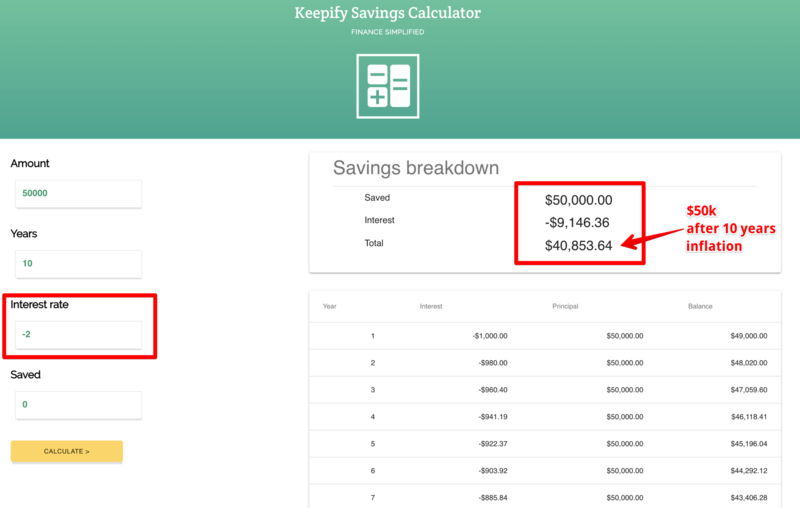 You can use the savings calculator above to calculate an inflation adjusted figure. Enter the same number of years, a starting amount of your retirement income goal, an interest rate of negative 2-2.5%, and an annual savings of $0. See an example screenshot. The final amount is your inflation adjusted income amount. See below for more on inflation. Most countries with central banks (like the US and Europe for example) have an inflation target for the currency. That means your dollar (for example) is worth a little less each year. The typical inflation targets are around 2% annually. Look at how 10 years of inflation will impact $50,000. The next step is to have goals and a plan to achieve them. Use these calculators as a great starting point or place to check-in on an idea, but if you’re not budgeting and saving regularly then it’s going to be difficult to retire or meet any particular goals. Living without a financial plan is stressful. Check out our budgeting templates for a ton of ways to get started with budgets and planning for your financial future.